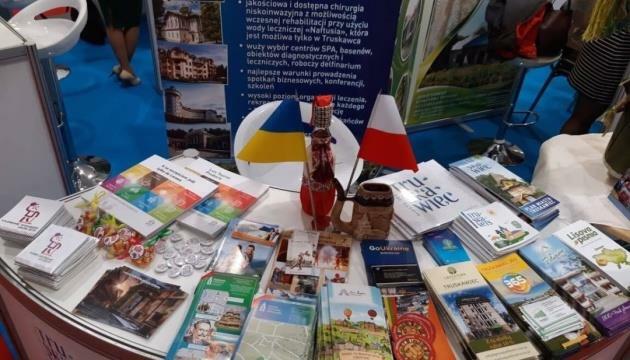 (MENAFN - UkrinForm) The Economic Development and Trade Ministry of Ukraine at the tourism exhibition in the Polish city of Łodz presented tourism opportunities of Ukrainian regions, the ministry's press service reported. 'On March 22, representatives of the Economic Development and Trade Ministry of Ukraine, as honorary partners at the invitation of the Polish side, presented Ukrainian tourism opportunities as part of the NA STYKU KULTUR (At the Crossroad of Cultures) tourism exhibition in Lodz (Poland). At the national stand, there were tourism products from 11 regions of Ukraine, including Lviv region, Chernihiv region, Ternopil region, Poltava region, Odesa region, Ivano-Frankivsk region, Kharkiv region," the report says. Oksana Serdiuk, Director of the Ministry's Tourism and Resorts Department, emphasized the growing role of tourism in establishing humanitarian ties between the two countries and noted the importance of the development of cultural tourism. "Ukraine and the Republic of Poland have a common cultural heritage. In particular, a striking example is the UNESCO World Heritage Sites - the wooden churches of the Carpathian region, she said.